Hey everyone! This interview is one of the most delightful conversations we’ve ever had on the Reading with Your Kids podcast! Today, we’re excited to welcome Jen Malone, author of teen & tween novels Wanderlost and Map to the Stars on our show. Jen is joining us today to talk about her new contemporary YA novel Changes in Latitudes. Her novel is about a girl facing the dissolution of her parents’ marriage, a new romance, and self-discovery while sailing down the Pacific coast. In this episode she joins Jed to talk about writing for tweens and teens, and why she’s so driven to connect teens and tweens with her stories. Hope you guys enjoy the interview! Jen Malone writes flirty young adult travel romances with HarperCollins and fun and humorous “girl power” middle grade adventures with Simon & Schuster. Jen’s published titles include Changes in Latitudes, Best Night Ever, The Sleepover, the You’re Invited series (with Gail Nall), At Your Service, Map to the Stars, Wanderlost, and Follow Your Art (a collaboration with Dreamworks Animation and Penguin Random House on a companion story to the animated film Trolls). She once spent a year travelling the world solo, met her husband on the highway (literally), and went into labor with her identical twins while on a rock star’s tour bus. These days she saves the drama for her books. A “road” trip novel that takes place at sea, Changes in Latitude tells the story of seventeen year-old Cassie, who’s navigating the fallout of her parent’s recent divorce, but when she returns home one night (long after curfew) to find a giant sailboat in their driveway, the ground falls out from under her once again. This time it’s replaced by the Pacific Ocean and her mother’s grand scheme to courier a sailboat from a shipyard in Oregon to new owners at the southern tip of Mexico… with the hope of rebuilding her relationship with Cassie in the process. Cassie wants nothing more than to put a little distance between herself and the mom Cassie blames for detonating their happy family, so of course the idea of being trapped on a boat with that same mother for four long months is oh-so-heavenly. Or not. Bu before she knows it Cassie, her mom, and Cassie’s fourteen year-old brother Drew are pointing their sails south, accompanied by two other Mexico-bound sailboats caravaning alongside them, one of which includes an extremely cute crew member. What’s it like writing both MG and YA? Jen talks about coming to writing career after another career in marketing and travel. What made her decide to take up writing and what has her journey to become a successful writer been like? More about Best. Night. Ever. 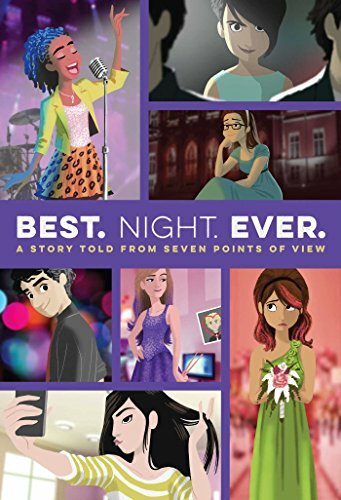 : A Story Told from Seven Points of View (mix) and how seven authors came together to write this book, which tells the story of one night from seven points of view. Jen’s upcoming novels & some interesting facts about her solo round-the-world trip that took her to forty-three countries over ten months. Tune in now to find out more! If you’ve enjoyed this episode then please rate and review our show in iTunes and share it by clicking the social media buttons at the bottom of this page! Finally, where can you find Jen? Read NextThanksgiving Special Episode with Carol Gordon Ekster!